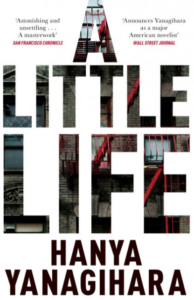 Hanya Yanagihara’s novel A Little Life (2015) is a masterwork in the realist tradition of American writing, showing what can still be done that is new and inspiring more than a century after Mark Twain, Edith Wharton, and Henry James. The novel has two major structural features: the relationship among four men who went to college together, as it plays out over time, and the story of one of them, Jude St. Francis, who, from early childhood until the age of fifteen was physically, emotionally, and sexually abused, facts he manages to keep from his friends until its effects on his psyche and behavior can no longer be concealed. The facts of Jude’s early life, hard to take and impossible to shake off once you learn them, are dealt out to the reader in much the same way they’re revealed to his friends, bit by horrific bit. A good part of the novel’s suspense comes from this strategy of gradual revelation, which, though manipulative, is also a blessing, since to have had the terrible history all at once would have been unbearable. out the kindness in his friends and associates, and expands our concept of the good that human beings are capable of. It seems like we are being asked: Why are men made the way they are, some to do untold damage, and others to act with seemingly limitless compassion? The deeper one goes in the story, the more pressing the question becomes. But the book raises questions that are not just philosophical. The more we learn about Jude’s history, and the more we see how it has wounded him so that he constantly feels the need to damage himself, the less it becomes possible to justify, explain, or even wrap one’s mind around such things. Our minds and hearts are forced to accommodate the unthinkable and to feel more pain, outrage, and sorrow on Jude’s behalf than we can tolerate. On the other hand, there is the fountain of lovingkindness this suffering evokes in the characters that surround him. Confronted by need such as Jude’s, we begin to ask ourselves if we would have been able to respond with the self-sacrifice and faithfulness shown by his friends and associates. The limits of our own altruism begin to look embarrassingly narrow. So the novel doesn’t just tell a story of heroic suffering, and equally heroic response, it models behavior for us and widens our perspectives, moves us to self-scrutiny and a more capacious worldview. Because of its cornucopia of finely drawn social, psychological, and cultural detail—the sushi bars, art openings, and law offices of contemporary Manhattan (it’s a realist novel, remember)—we can’t dismiss the extremes of good and evil the novel dramatizes or the moral and intellectual challenges it poses: They’re rooted too convincingly in our own sense of the way things are. The novel’s social dimension is instructive, too. The friends—who call on each other in emergencies, celebrate one another’s achievements, have dinner together, and vacation together— comprise a cross-section of social, cultural, sexual, and racial types. One, a gifted and hard-working-painter, is African-American; he comes from a strongly supportive female dominated household. Another, an architect, has a wealthy, successful black father and a white mother. A third, an actor, is of Scandinavian descent and comes from farmers of modest means in the West; and Jude, a foundling who becomes an expert, highly-paid lawyer, seems to be of mixed race, but no one knows which races or how many. The painter is gay, the architect is straight, the actor is bisexual, and Jude, who has been sexually abused and exploited by men, never gets to find out what he is. But he is adopted by a Jewish law professor and his wife and given many years of loving and expert treatment by his Jewish doctor, who outdoes the Good Samaritan. The setting, New York City, explains the possibility of this kind of social mix, but perhaps not the extent of it. Yanigihara pushes the envelope on all fronts.